Hives, or the medical term “urticaria” is a common allergic disorder in which a red, itchy, lumpy skin rash appears ‘out of the blue’. 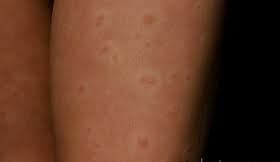 The skin lumps are known as weals. 15-20% of the population would experience hives at some point of their lives. Urticaria is caused by the release of histamine, a chemical substance the body produces when there is an allergen. The allergen, something that stimulates allergic reaction, can be many things, some common causes are foods, drugs, and infestations, but in 50% of cases, the real cause is unknown. Most of the time, no test are required. Your doctor will diagnose by the symptom and evaluating the skin. The main examination should be making sure your throat, or airway, is not involved, since obstruction of the airway can be fatal (read below in Red Flag). First rule is avoiding the possible allergen. Anti-histamine. Most are available over the counter, but when these don’t relieve the symptoms you should see a doctor, who might prescribe another type of antihistamine or add other medications. Decrease activity. Avoid getting hot and sweaty. Avod alcohol and caffeine-containing drinks. Most urticaria will resolve completely after 2-3 weeks, without treatment. When the symptoms persist more than 6 weeks, it is called chronic urticaria. This chronic conditions affects 1% of the population and is a frustrating condition for both the patient and caregiver. While acute urticaria does not need any additional test, your doctor will suggest some test for the chronic condition. Anti-histamines are still the main therapy for chronic urticaria, with additional medications, which might include steroids. If you notice swelling of the lips and around the eyes, especially when you feel short of breath, you should see a doctor immediately. This condition may be an early sign of the serious form of urticaria, angio-edema, where the lining of the throat swells and can obstruct the airway.